Nitro-Blend™ 27-0-0 is a high efficacy form of liquid Nitrogen designed for large area applications. Delivering a combination of Nitrogen sources along with our proprietary fermentation process to add extracts will enhance intake. Nitro-Blend™ contains stabilizers to reduce potential for volatility and “gassing-off”. Pre-digested organic acids along with vitamins and enzymes make this an ideal choice when spraying wall to wall. 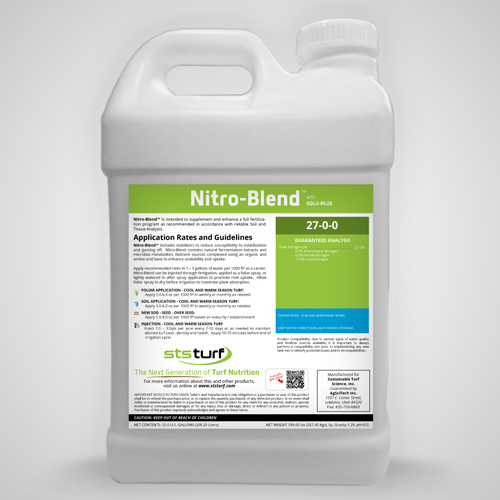 Nitro-Blend 27-0-0 delivers Urea, Ammonium and Nitrate forms of Nitrogen to promote vascular balance. Stabilized Nitrogen allows use of lower rates to achieve the desired results without risk of volatilizing. Compatible with a wide array of products and raw source materials.